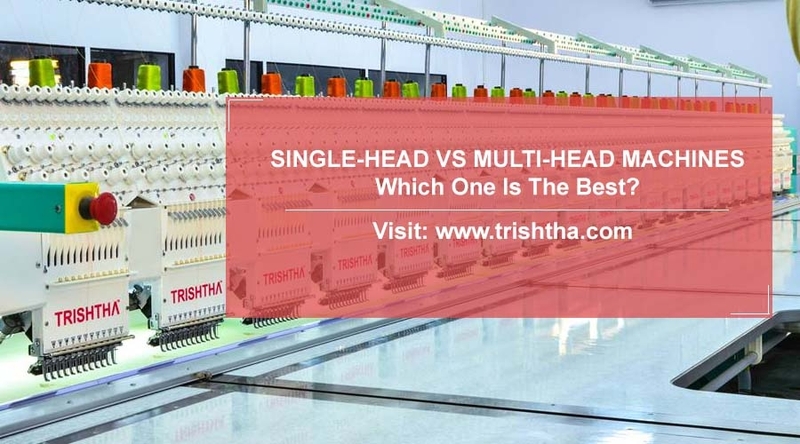 Single Head Vs Multi Head Machines Which One Is The Best - Trishtha Industries Pvt. Ltd.
Single-head VS multi-head machines: which one is the best? The world of embroidery is rapidly changing and a lot of embroidery enthusiasts are taking it up as full-time business. If you are one among them, it is quite natural for you to feel overwhelmed with all the different choices of embroidery machines available in the market, especially when it comes to choosing between single-head and multi-head machines. If you are thinking of investing in embroidery machines, know what the industry insiders at Trishtha think about both single-head and multi-head machines. As the name suggests, this embroidery machine comes with a single head. However, it can have multiple needles. This type of machine is compact in size and best for home-based businesses. They are not equipped to handle large volume of productions. Embroidery machines with multiple heads are generally referred to as industrial or commercial machines. This is because these machines are specifically designed to manage and keep up with production in great volume. For installing this machine, you will need a larger space like a factory. Multi-head machines are not well-suited for the home environment. If you ask which embroidery machine is the best, there is no clear cut answer to that. Both the machines are great investment and offer value for money. But, your decision must ultimate depend on your business requirement, budget and space. Since multi-head machines are able to handle production pressure, they are obviously much more preferred. However, for those on a tight budget or restricted space, single-head machines are ideal. So, make your choice based on your individualized requirements. If you still need any kind of assistance, give Trishtha a call and we will be more than happy to provide you with in-depth details about both the above-mentioned machines.